New, Factory stainless steel Springfield Armory magazine for the full size XD9, 9mm. This is a high capacity magazine with 16rd capacity. State magazine restrictions apply, know your state's laws prior to purchase. New, Factory stainless steel Springfield Armory magazine for the full size XD40, 40S&W. This is a high capacity magazine with 12rd capacity. State magazine restrictions apply, know your state's laws prior to purchase. New, Factory stainless steel Springfield Armory magazine for the sub compact XD9, 9mm. This is a high capacity magazine with 13rd capacity. Note, we also have factory 16rd magazines for the full size version that will fit this model as well, but not with a flush fit. They work great for backup magazines. State magazine restrictions apply, know your state's laws prior to purchase. 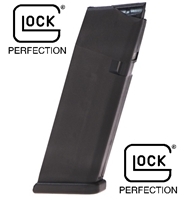 Heavy duty steel reinforced polymer magazine that will last the lifetime of the gun itself. This magazine fits the Glock 21 and will also function in a Glock 30, but will not sit flush with the bottom of the mag well. Factory Glock 17 9mm 17rd magazine. Gen4, heavy duty construction, lightweight polymer with reinforced steel liner. These mags will work with Glock models: 17, 18, 19, 26, 34 and possibly others as well. Factory Glock 17 9mm 10rd magazine. Gen4, heavy duty construction, lightweight polymer with reinforced steel liner. These mags will work with Glock models: 17, 18, 19, 26, 34 and possibly others as well. Factory Glock magazine for the model 22 40cal, 15rd high capacity magazine. Will also work with models 23, 27 and 35. Heavy duty polymer construction with reinforced steel liner. Factory Glock magazine for the model 22 40cal, 10rd capacity magazine. Will also work with models 23, 27 and 35. Heavy duty polymer construction with reinforced steel liner.